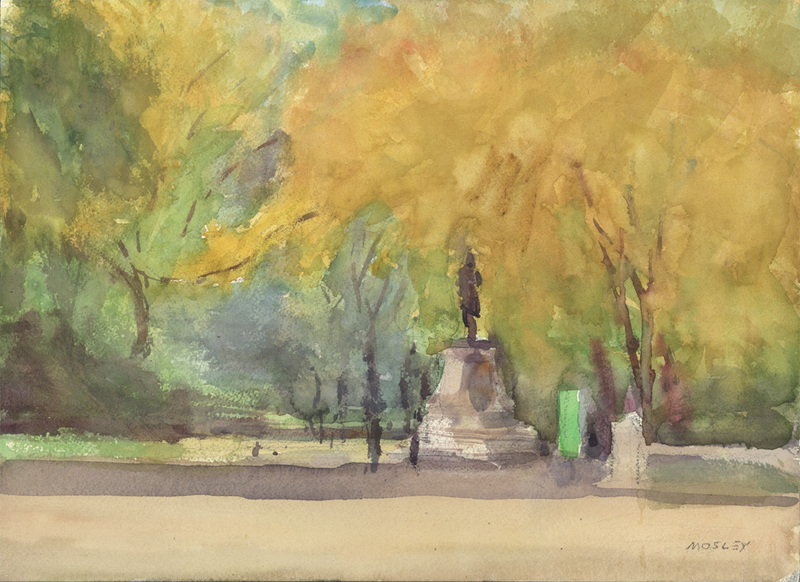 A plein air watercolor painting showing Central Park in fall with golden foliage in the area known as “The Mall” and also known as “Literary Walk” because of the statues of renowned authors that line the pedestrian path on the southern end. The sculpture in the painting is of William Shakespeare (by the sculptor John Quincy Adams Ward) and nearby in the park (although not in the painting) is a sculpture of Christopher Columbus. A further note of interest is that The Mall in Central Park is one of the largest and last remaining stands of AMerican Elm trees in North America.